This contest has been marked as a duplicate of Win the Ultimate Star Wars Gift Set Over $500 In Merch!. 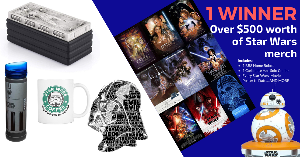 Prize: 1 Lucky Winner gets hundreds of dollars of Star Wars merch! 8 Lucky Winners also get this awesome Star Wars mug!